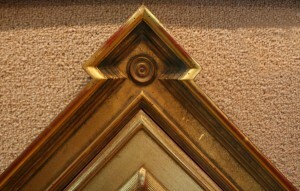 Many knowledgeable artists, collectors and other art lovers come to Jonathan Frost for their framing. Choosing the best presentation is an interesting and memorable process, and the results are gratifying and enduring. Our specialties include beautiful Custom Picture Framing for prints, photos, canvasses, sports memorabilia, collectibles, mirrors and much more. If you have an item that needs to be properly preserved and displayed, we can frame it. If you bought a beautiful signed Wyeth Print at the Farnsworth Art Museum and need the piece framed with museum quality to protect its value then come across the street to Jonathan at the Frameshop. We also frame originals for many of the local fine art galleries and their artists. 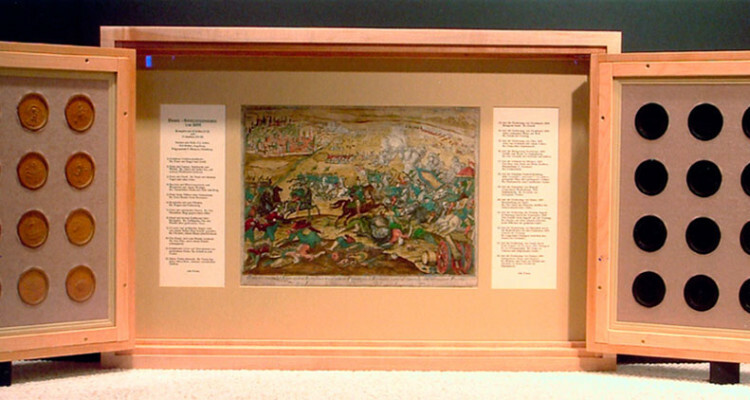 Maple display case for 16th-century German game pieces, designed by Jonathan Frost. Carved pieces are visible from both sides and are held in place without adhesive. Mouldings were fabricated by Bench Dogs, of Rockland, Maine, to J. Frost’s specifications.